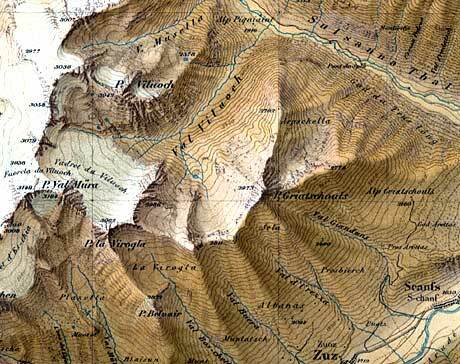 The Swiss Alpine Club (SAC) published multiple so-called “excursion maps” between 1863 and 1934. The scale was set at 1:50,000 for most of those maps. The first four map sheets were still produced monochromatic and with hachures. Already in 1866 the topography was depicted using a shaded relief and contour lines. The cartography was executed by Rudolf Leuzinger until 1903, when respectively Fridolin Becker, Xaver Imfeld or Julius Frey took over. SAC excursion map “Albulagebiet” with shaded relief, original scale 1:50,000 (size 70 x 48 cm), five-colour, 1892. Press / publisher: Topographische Anstalt Gebrüder Kümmerly, Bern. SAC excursion map “Albulagebiet” (detail), 1892. Shaded relief combined with geographical names. 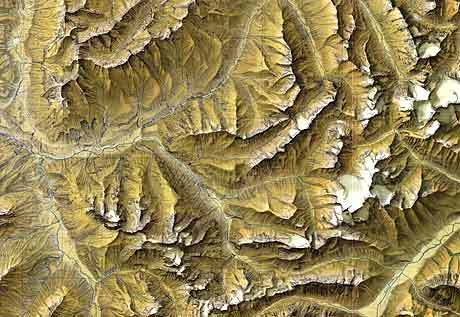 Another masterpiece of multicoloured shaded relief depiction is the SAC map “Evolena–Zermatt–Monte Rosa”.